In the remote Sonoran desert of southwest Arizona rises a rugged volcanic mountain range called the Kofa Mountains. The mountains are named after the King of Arizona mine located in the center of range, from which millions of dollars worth of gold and silver were extracted in the early 1900s. 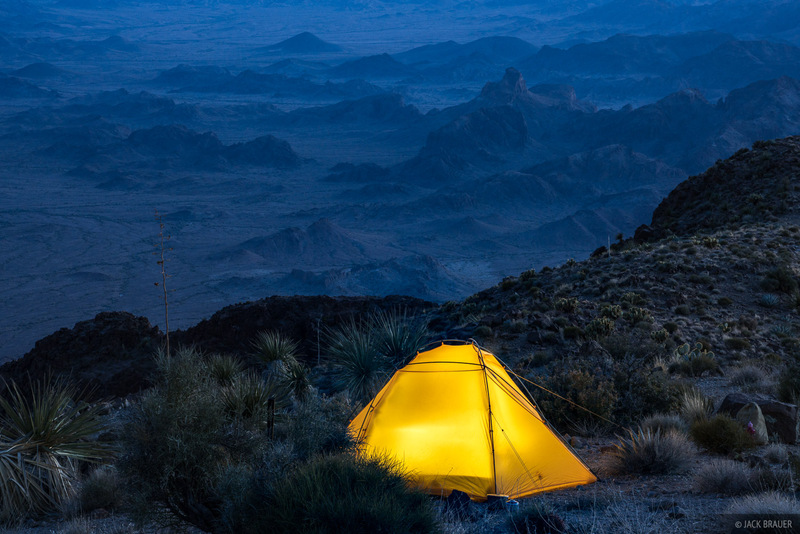 Now the entire range is included in the Kofa National Wildlife Refuge which was established in 1939 after a campaign by the Arizona Boy Scouts to protect the desert bighorn sheep which live there. 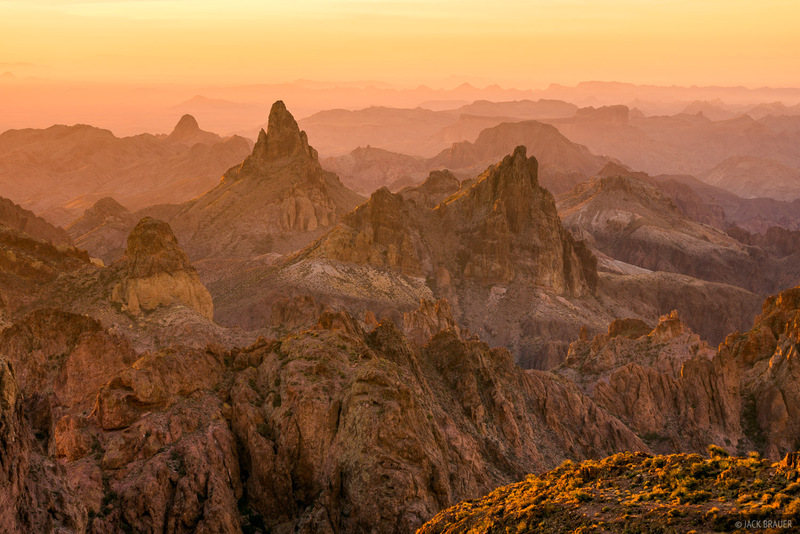 Back in December 2016 fellow photographer Floris Van Breugel posted some awesome photos from the Kofa Mountains, and that name Kofa stuck in my head ever since. After some research I figured that hiking Signal Peak would be a cool idea; then I checked Floris's post again and saw that that's exactly what they had done! Well, if I'm going to be following footsteps then Floris and Aubrey's are not a bad choice. So anyways, hats off to Floris for the inspiration and originally putting this range on my radar. Backlit teddy bear chollas at sunset along the foot of the Kofa Mountains, Arizona. 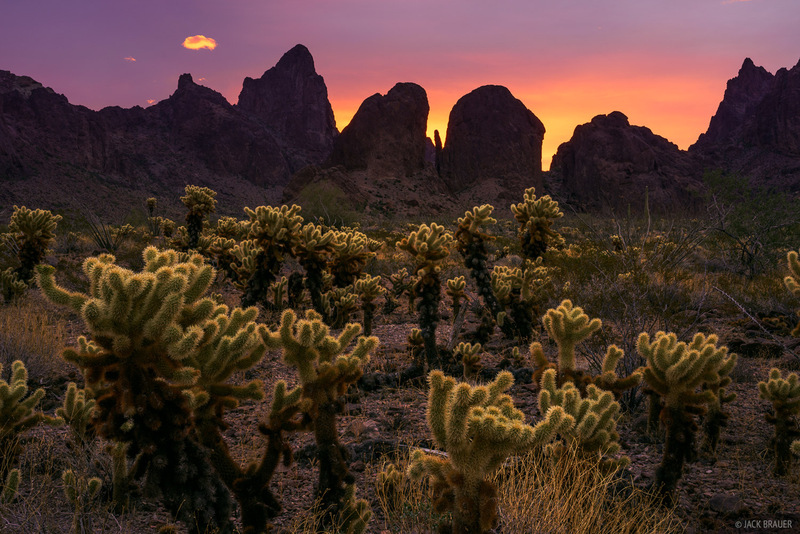 Teddy Bear Cholla (pronounced like "choya") are profuse along the base of the Kofa Mountains. These fuzzy-looking cacti have tiny barbed spines that stick to anything they touch like velcro, except much bloodier to remove if you're unfortunate enough to get one stuck on you. The spiny arms fall off the plant at the slightest touch, and wherever they fall to the ground they actually start growing a new plant! While the spines catch anything that touches them, they also do a great job of catching light too! 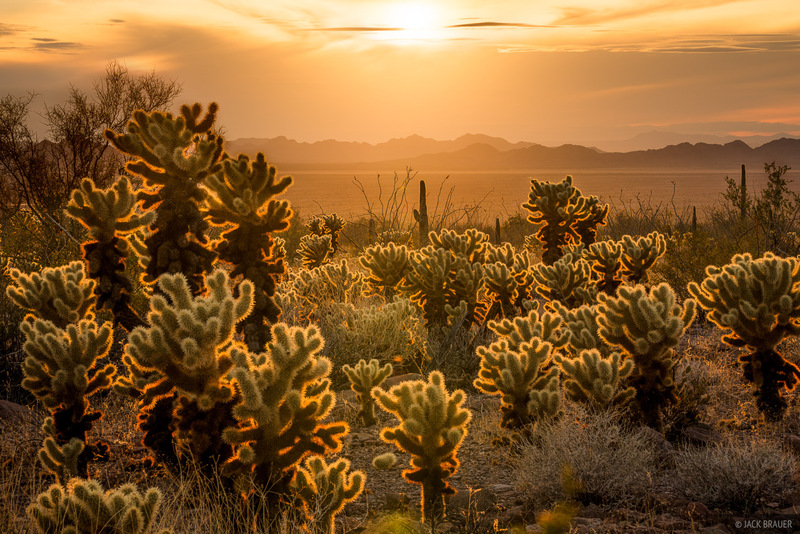 Backlit cholla glow radiantly and are thus a favorite subject for photographers in the Sonoran desert. Late sunset light on Squaw Peak and the Kofa Mountains. After a night camping in our truck at the base of the mountains, the next day we hiked up Signal Peak, the tallest mountain in the range at 4,877 feet. 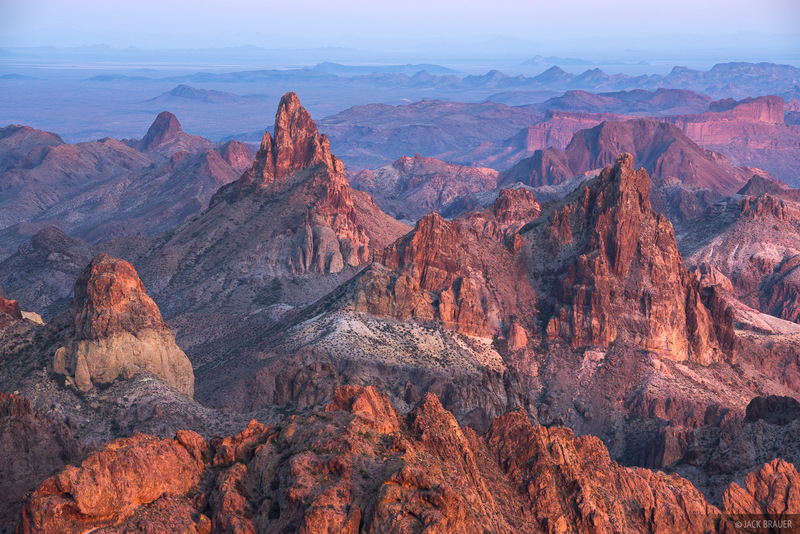 From the top is a spectacular 360º view of the surrounding deserts and mountains, including the impressive spire of Squaw Peak and its neighbors. Not a bad place to spend the night! Luckily, unlike Floris and Aubrey's windy "misadventure" during which their tent snapped in high winds up there, we were fortunate to enjoy perfect calm weather during our time up there. Prickly Pear cacti overlooking the Sonoran Desert shortly after sunset. Sunset at our camp on Signal Peak (4877 ft.), with a grand view overlooking the Sonoran Desert and Castle Dome Mountains to the south. Needless to say it's always a treat to camp up high like this. 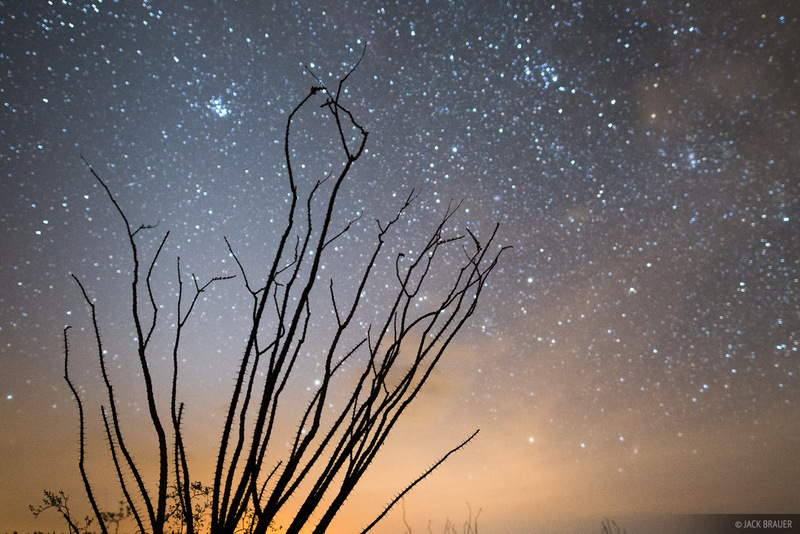 At night we could see the city lights of Yuma to the south, and even Mexicali further south over the border in Mexico. Our tent on Signal Peak. 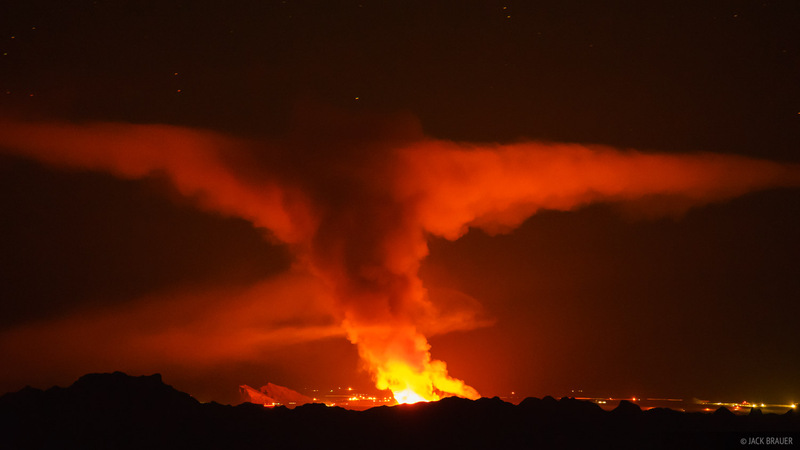 Wildfire in the Castle Dome Mountains near Yuma - March 2018. With such a rad view up on Signal Peak, I had brought my telephoto lens which came in handy for snapping some pics of a wildfire that was blazing in the Castle Dome Mountains near Yuma to the south. 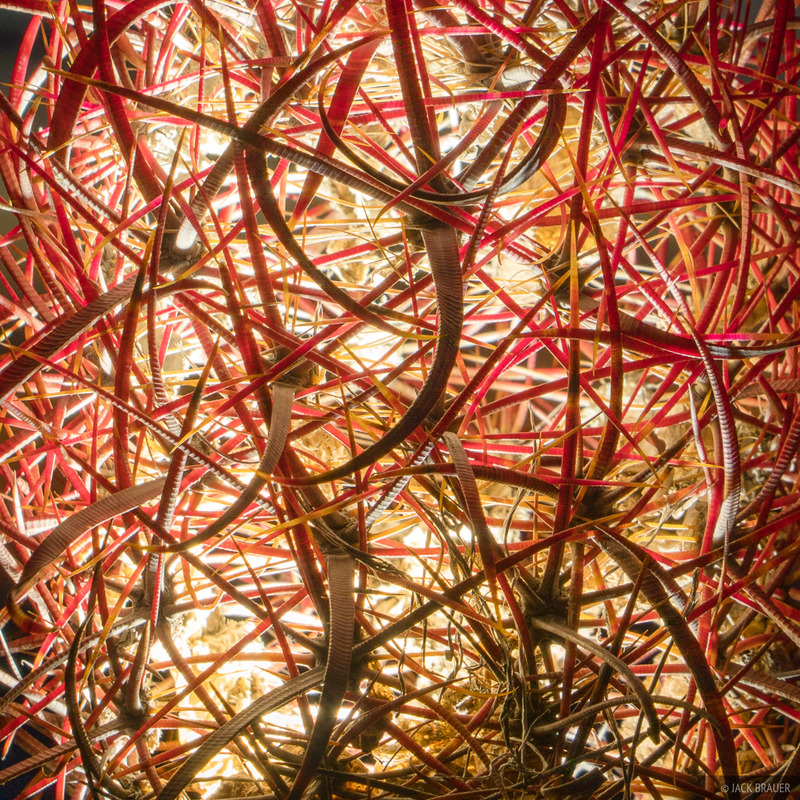 A hollow barrel cactus illuminated from within. I found an odd remnant of a barrel cactus where all that remained was the tangled shell of spines - the cactus itself had long rotted away. I put my headlamp into the base to turn it into a lamp, then had fun taking some trippy photos! The sunrise light behind Squaw Peak was even more spectacular than the sunset light, I thought, with all the mountain layers in the colored haze. Unfortunately after my morning shoot I realized that I had not picked the best spot to shoot from and I knew there was a much better composition I could have made instead. Any perfectionist photographer (and I assume there are many of us) can relate to the frustrating feeling of having photographed great light with a less-than-optimal composition. With my heart set on this photo, and having already put so much effort into coming here and camping on the peak, I decided that the best solution would be to just camp another night up there and try again next morning! Fortunately for me, Claudia is quite relaxed about things like this so she was cool with it. So, we left our tent and equipment up near the summit, hiked all the way back down to the truck to get more water and food, then hiked all the way back up again! I was feeling like an idiot about the whole thing, but hey - there's worse places in the world to have to camp a second night! And we also got to see a family of bighorn sheep on the way down. Luckily the sunrise the next morning was pretty much the same so I got my shot after all. Whew! 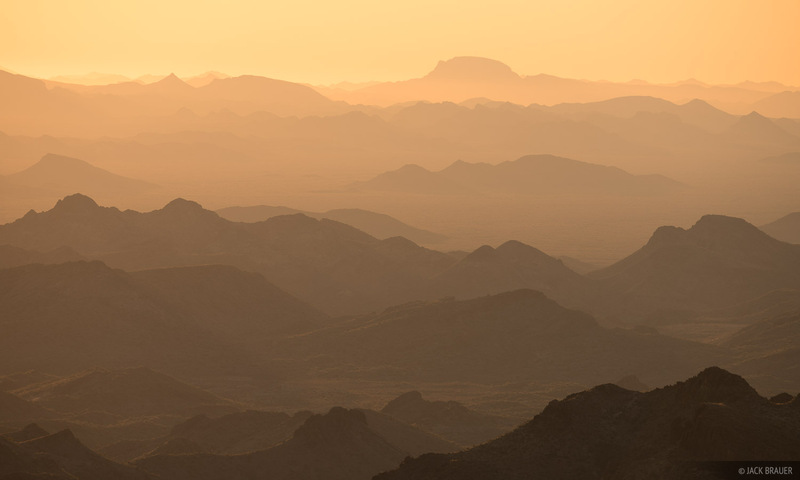 Layers of sunrise light in the mountains of the Sonoran Desert of southwest Arizona. 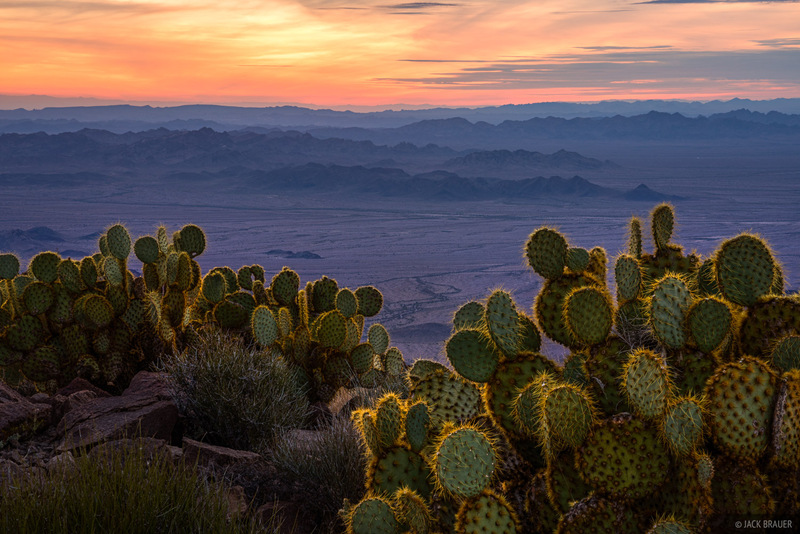 Radiant sunrise light above cholla cacti at the foot of the Kofa Mountains. Back at the truck after our two nights on the summit, we spent one more night at the base again and I was treated to a fantastic sunrise the next morning. 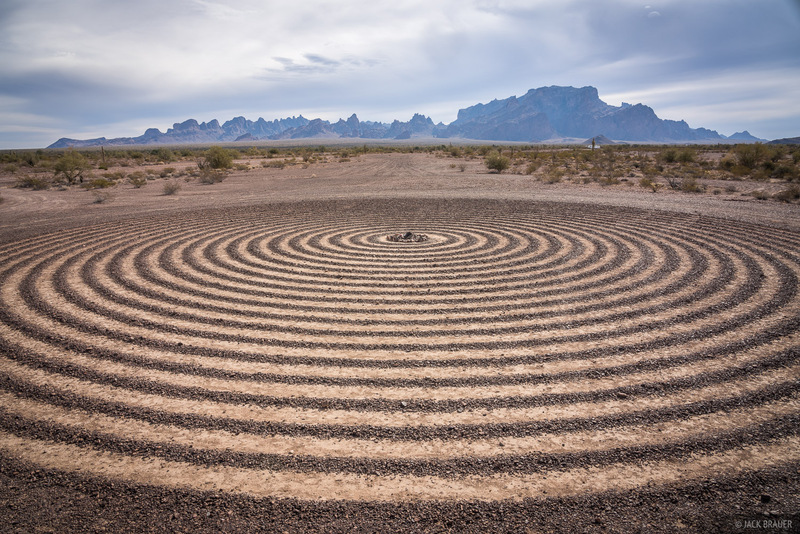 The spiral labyrinth with Signal Peak and the Kofa Mountains behind. On our way out we visited the "Spiral Labyrinth", a roughly 60-foot diameter spiral carved into the desert surface not far from the entrance road junction of Palm Canyon and Kofa Queen roads. Though we didn't have time to do the full meditative walk through it, I did enjoy taking a few quick photos before we hit the road again! Posted in Backpacking & Trekking, Canyons & Deserts and tagged Arizona.